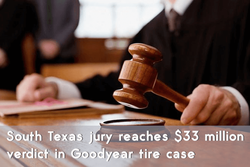 James Peate, a spokesperson for Goodyear, said that the jury verdict is one of the biggest ever returned against this company. At the same time, he declined further comment, including on whether Goodyear plans to change any tire manufacturing practices as a result of the verdict. The Goodyear tire on the cement truck failed while the truck was driving. When the tire failed, the truck rolled over and slid down the road, crushing Ramiro Munoz’s car. In the course of investigation, it was found that the left front tire had a catastrophic tread separation. As the technical expert of TiresVote notes, it was the manufacturing defect in the tire that the jury found to be the cause of the death in question. According to the court record, the Goodyear G286A «Super Single» heavy truck tire was made by Goodyear in 2009 at its plant in Dansville that was notorious for poor quality control and manufacturing tires in less-than-ideal conditions. The media had already made reports on safety measure shortcomings in Goodyear tire plants. For example, more than 40,000 Goodyear Wrangler Silent Armor tires were recalled in 2012. Which, sadly, leads to a conclusion that Goodyear had put its production goals and its profits ahead of the safety of the public at large. «Saving up» may cost you your health or your life. We hope that this court verdict will become a signal for making changes not only for Goodyear but for other tire makers as well. Tires are the main element of road safety, and tire makers should never put their proceeds from tire sales above people’s lives. At the same time, the car owners must be aware of the fact that irresponsible choice of tires or trying so save a few extra bucks may cost the driver and his passengers their health and lives.